Waiting her turn to show in the ring, senior Alexis Munguia smiles in anticipation of her last school show. 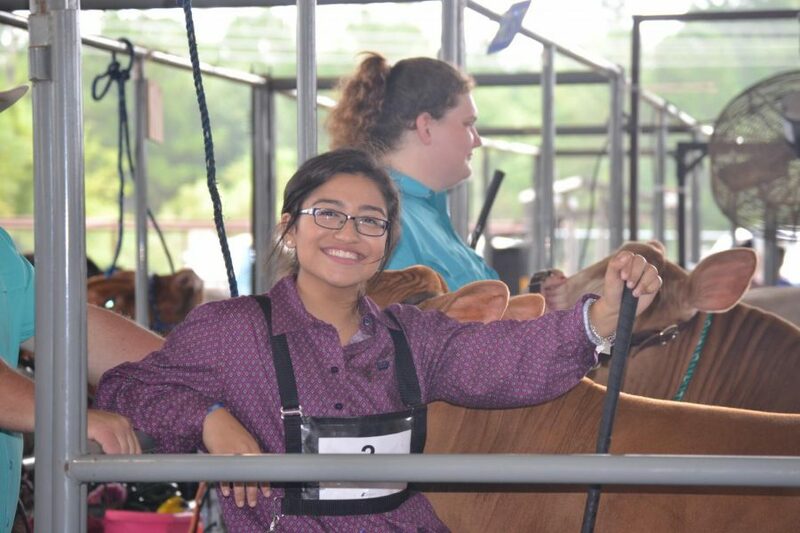 The Livestock show results for exhibitors showing yearly projects for the MISD District show from this past weekend have many students taking home Grands and Reserves. The live auction results end with students receiving well-deserved compensation for their time spent over the year. Showmanship Champions include Steer exhibitor senior Alexis Munguia; and hog exhibitor junior Kamryn Bevel. Grand Champions include Turkey exhibitor junior Kamryn Bevel; and lamb exhibitor freshman Katelyn Meister. Reserve Grand Champions include Chicken exhibitor sophomore Clayton Szymanski; and goat exhibitor freshman Drew Cheshire. Class 1 heifer exhibitors include 1st place senior Aubrey Parker; and 4th and 5th place senior Shelbie Hutchinson showing her two heifers. Class 2 heifer exhibitors include 5th place sophomore Hunter Gregory; 6th place junior Avery Burrage; and 7th place sophomore Kennedy Dean. Class 1 steer exhibitors include 1st place senior Alexis Munguia; and 3rd place junior Stormi Thompson. Class 3 steer Exhibitors include 3rd place junior Mallory Knee. 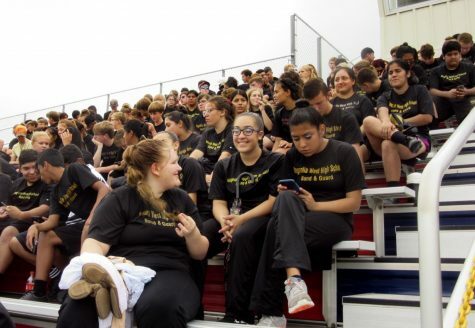 Overall placings in this category were 3rd place senior Alexis Munguia; 6th place junior Mallory Knee; and 1st alternate junior Stormi Thompson. Chicken exhibitors placings include 7th place sophomore Whitten Walker; and 9th place sophomore Shelby Lewandowski. Overall placing for rabbit exhibitors includes 4th place freshman Katelyn Meister; 9th place sophomore Payton Trapnell; 11th place freshman Samantha Oglesbee; 1st alternate freshman Lakyn Hacker; and 2nd alternate junior Alyson Hillman. Overall auction order for goat exhibitors includes 2nd place and freshman Drew Cheshire; 3rd place freshman Mason Hughes; 4th place sophomore Hunter Gregory; 10th place freshman Jadyn Hughes; and 12th place senior Abbey Anderson. Overall auction order for lamb exhibitors includes 1st place freshman Katelyn Meister; 3rd place sophomore Amanda Wilder; 6th place freshman Drew Cheshire; 10th place sophomore Hunter Gregory; and 2nd alternate junior Madison Moxley. Class 1 placings included 4th place freshman Jayden Vaughn. Class 2 placings include 3rd place sophomore Drew Cheshire; 7th place freshman Katelyn Vick; and 8th place junior Stormi Thompson. Class 3 placings include 1st place and sophomore Amanda Wilder; and 3rd place junior Madison Moxley. Class 4 placings include 1st place freshman Katelyn Meister; 4th place sophomore Hunter Gregory; and 6th place junior Alyson Hillman. Overall auction order for hog exhibitors include: 6th place senior Randen Kurten; 8th place junior Kamryn Bevel; 11th place junior Madison Myers; 14th place junior Braden Copeland; 15th place junior Shelby Husky; 16th place freshman Jacob Johnson; 18th place freshman Ross Reynolds; 20th place sophomore Austin Lane; 22nd place freshman Maddy Munoz; 23rd place freshman Hayden Jansky; and 25th place sophomore Grace Matocha. Class 2 placings include 4th place sophomore Grace Matocha and 3 placings which include 3rd place senior Randen Kurten; 4th place junior Madison Myers; 5th place freshman Maddy Munoz; and 7th place freshman Tye Copeland. Class 4 placings include 3rd place junior Kamryn Bevel; 4th place senior Shelby Husky; 5th place sophomore Austin Lane; 6th place freshman Hayden Jansky; and 7th place freshman Cameron Hillman. Class 5 placings include 3rd place junior Braden Copeland; 4th place freshman Jacob Johnson; 5th place freshman Ross Reynolds; 8th place senior Lexy Simpson; and 9th place junior Hunter May.